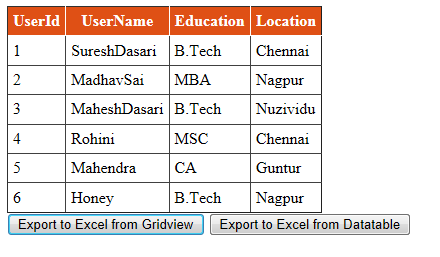 Here I will explain how to export data to excel from datatable or dataset in asp.net using c# and vb.net or export data to excel from gridview in asp.net using c# and vb.net. 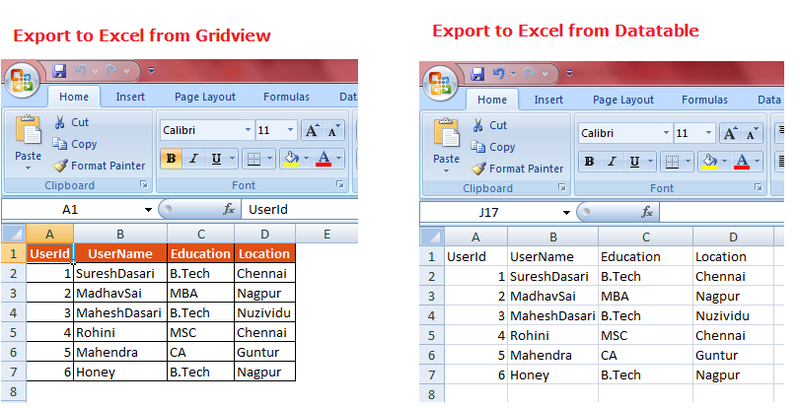 In previous posts I explained export gridview data to csv file in asp.net, export gridview data to pdf file in asp.net, export data from excel to gridview in asp.net, import excel data to sql server in asp.net, asp.net Google currency converter and many articles relating to gridview, asp.net, c#. Now I will explain how to export data to excel from datatable or dataset in asp.net using c# and vb.net. <asp:Button ID="btnExport" runat="server" Text="Export to Excel from Gridview"
<asp:Button ID="btnExportTable" runat="server" Text="Export to Excel from Datatable"
There is not error, but i am not able to export the Xls file, Browser is not showing up to save or open the file. No issue with browser because for other website it allows me to export. How to give color/formatting for the header row when exporting from data table?